I got some momentum going today and made it all the way into San Angelo. Actually, the conditions everywhere else were so poor, I thought it made more sense to go someplace I knew I would be comfortable and safe and pay less for two nights camping than I did for the one night in Santa Rosa. On the roads between Santa Rosa and Big Spring, TX, I drove through headwinds and crosswinds that were brutal. The sky was red and gray from the dirt in the air -- no blue. In places, the dirt was blowing at a 90-degree angle across the road and looked like a swiftly flowing river. It made the driving a very sporting adventure. Shortly after I drove through Big Spring, in addition to the winds, I ran into the smoke from the fires that have been burning all over West Texas. The smoke persisted the rest of drive to San Angelo from Big Spring. At times the visibility was less than 1/2 mile, and the air was acrid. I saw only a small burned area east of Big Spring, but know there are many square miles burning to produce such smoke. It certainly made for a spectacular sunset this evening. It is not as heavy here as it was west and north. I'm going to "flake out" on you early tonight. I am showered and, again, one dog walk away from a good night's sleep. Tomorrow is a reunion picnic for a group of Viet Nam era veterans called The Doggers who are commemorating the Fall of Saigon. Perhaps, there will even be pictures to share! Good night! Remember what I was saying about uncertainty regarding the capability of the Big Bad Blue Bronco to make this trip. Well, I was, as they say, "spot on" on that one. The trip started well. I got off just after 0800 and was just coming over the pass at Monument, Colorado -- about 35 miles into the trip -- when the BBBB began coughing and limping and making all manner of sounds with flashing lights to go with it. I took the nearest exit and coasted to a stop light and prayed it would start again. It did, but with no oil pressure it didn't want to stay that way. I managed to coax a little pressure out of the engine at the red light and by the time it turned green we limped across the intersection and into a little parking lot. The whole time, I swear I could hear the Bronco whimpering, "I'm am not pulling this thing one more mile, much less to Texas!" I found a safe out-of the-way parking spot and messaged my son, Josh. Pretty soon, he was calling back that he was on his way with my trusty Highlander. I could not ask for a more handsome and reliable hero, especially over this past year. He never lets me down. My dogs, on the other hand... Because I am such a good dog owner, and kind, and considerate. Before I did anything else, I put the dogs on the leash and was going to take them for a little walk. Within moments, they'd slipped their collars and both took off across a four-lane road. It took two of us, but they were finally corralled and releashed (with tighter collars) and back across the highway and back into the car to reflect on their transgressions. Within minutes of Josh's arrival, we had the Bronco unloaded and the Highlander hitched up and loaded up and I was ready to go again. The loading and unloading took a little time because along with a chair for a friend in San Antonio (I have to get rid of those chairs somehow), I am carrying over 100 blankets in all sizes from baby to twin size bed for a special drive being conducted by Project Linus for the military dependent families evacuated from the triple tragedies in Japan. I am delivering them to San Antonio and will write more about it later in the trip. Josh limped back to Parker in the Bronco, and I turned the Highlander onto I-25 heading south. The trip after that was pleasant mostly, except for the sound of gas being sucked through the carburetor at a ridiculous rate. At 8.8-11 miles to the gallon, this will be one of my costlier camping trips. But as I slipped past the Spanish Peaks and over the Raton Pass, the enjoyment of the trip came back in the scenery and the wildlife. We're camped near Santa Rosa, New Mexico, and one dog walk away from bedding down for the night. Will write more tomorrow. Last night, my adult son looked at me and said, "You know I am so envious of you right now, don't you?" We'd been talking about the final preparations for my trip to Texas, and the things that remained to be done or checked out on the Big Bad Blue Bronco and the camper. I thought I knew what he was talking about, but I never take such things for granted, and so I asked what he meant. "This trip," he said. And I knew. I would be envious, too, if I were in his shoes. We are so much alike, he and I. Adventure tugs at both of us, and although his relationship with her has been at times much riskier than mine, both of us have driven our parents crazy with our desire for her. I don't know about Josh, but I enjoy the solitude that the road trip brings. Sometimes I turn off the radio, just listening to the sounds of the car and the road singing that song that I know from so many road trips going back to the Golden Years of Car Travel: the mid 1950s. I enjoy the tableau changing around me as I go, from the geographical to the zoological to the botanical. I enjoy the relative anonymity of travel. I can be my best self without concern as to anyone harmed by my truthfulness. Or I can be someone entirely different; I can try on some new feature, like a hat or a mustache, without concern about embarrassing my children (although I do remind them from time to time that this is one of my primary tasks as a parent). My excitement and anticipation of Adventure has been balanced by Anxiety. It's the usual stuff: Will the truck make the entire journey without issue; am I up to the task of hitching and unhitching without my partner and life-coach at every stop; how am I going to get the dogs in-and-out of that damned big truck; will my old beat up body get whipped into shape before I am whipped; etc., etc., etc. My hope is that this conflict between Adventure and Anxiety makes me balanced and prepared for what lies ahead. We all live in hope, eh? I was able to sit outside on the patio early this morning to have my coffee and meditation in the sunshine accompanied by birdsong. I haven't been able to sit outside like this in the early morning since last fall. If there wasn't snow on the ground, it was too cold, windy and unpleasant. But this morning was perfect. A glorious Palm Sunday morning, and my spirit is ready for spring! I've changed some since last spring. My hair is longer. In fact, it's longer than it has been in probably close to 30 years. When you're married, working, mothering, and running a household, short hair is just easier. I maintained a wash and wear haircut for most of that 30 years, if not most of my life. My profile picture is pretty much how I have looked forever. Not anymore! I'm enjoying caring for it, brushing it, styling it. Most of all I'm enjoying the way it feels when the breeze lifts it and brushes it against my shoulders. The last time my hair was this long, I was teaching Communicative Skills at the Electronic Security Command NCO Leadership School at Goodfellow AFB in San Angelo, Texas. I ended up cutting it all off because it created negative critique fodder. Critiques were the feedback forms filled out by students who had just been through the course. Between my long hair and my slipping bra straps, I got some scathing critiques -- not much of substance on my teaching skills, but plenty of criticism on my personal appearance. As a result, I still prefer racer back bras. This time, last year, Bill and I were only three weeks away from leaving on what would become our last roadtrip together. Spring came late to Colorado last year. We had major heavy wet snows in April. I did a lot of shoveling...I did ALL of the shoveling. Josh was in Korea and Bill was in the wheelchair, so I was chief shoveler. This is when owning a corner lot is a pain in the kazitsa! I was looking forward to the trip, but worried that if we left town too early, we'd come home to find tickets from the HOA for not taking care of the shoveling. Bill, on the other hand, wanted to leave by early April. He was so fed up with the cold, and had even given up poker nights because it was too cold to go out. I think this is when I began to suspect that a little more was going on than discomfort and fatigue from a long winter. This year, spring seems to have come early to the high plains. Even if it snows while I am on the road to Texas later this month, I will be leaving Josh in charge as chief shoveler. With that problem taken care of, I am still feeling my usual anxiety build as the departure date gets closer. I worry about everything from getting the camper hooked up without breaking anything, to whether or not I will be affected by the fires burning throughout western Kansas and West Texas, to how I am going to get those little dogs in and out of that damn big truck at every rest stop. It will be our first long trip in the Big Bad Blue Bronco. It's a 1989 truck and the odometer has rolled over at least once -- it currently reads 859 miles. I know the gas bill is going to eat me alive on this trip. It cost $60 to fill my Highlander yesterday! My rough estimate is that the gas for the trip to the gulf coast and back is going to run about $600 (using $3.75 as an average cost and figuring 15 mpg). I'll be pulling my hotel and restaurant along with me, although I will have to pay for camping facilities (anywhere from $15-$40 a night) and groceries. From my current perspective, it doesn't sound like a bad way to live. Let's see how I feel after one or two weeks on the road! 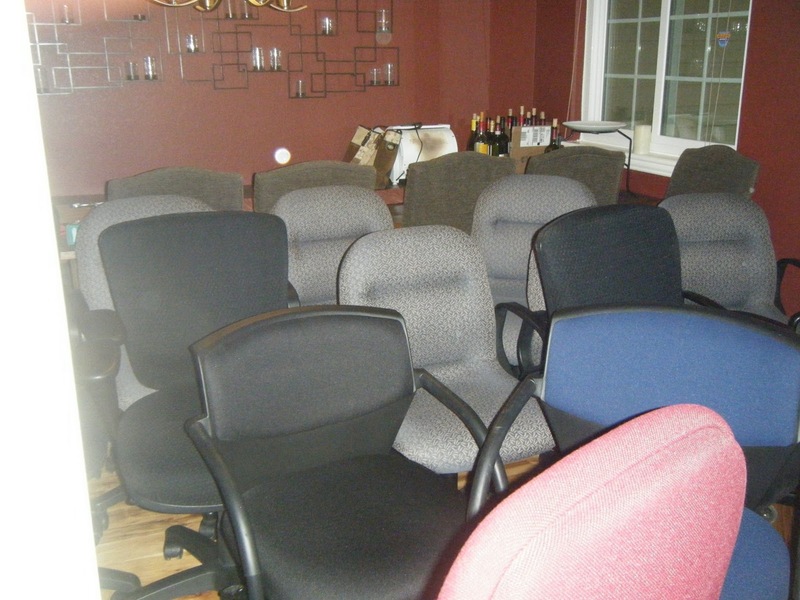 For those of you following the Saga of the Chairs, we have sold eight of the 280; however, I hope to sell at least nine more before this day is over. 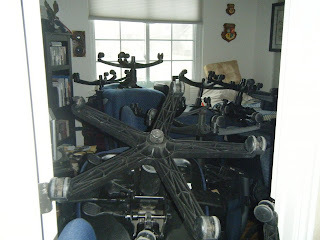 Taking the house back, one chair at a time. I turned 61 this week. It was a birthday I'd intended to skip. I didn't circle it on any calendars or leave notes to remind people. But, we live in a social networking age and all of my friends on Facebook found out it was my birthday when they signed in on Wednesday. Dozens of them festooned my wall with birthday greetings and well wishes. I have to admit, it was really very nice. Having so many people acknowledge that the day is special for me made me feel special and loved. I savored the attention. Bill always had a hard time remembering my birthday; and I found if I wanted it acknowledged, I had to bring it to his attention. The year I was pregnant with Emily (1986), he forgot it altogether until Josh came bouncing out to breakfast wishing me a "Happy Birthday, Mom!" Bill looked like he'd been slapped upside the head with a cod. He tried, mightily, to remember it in the years after that, but it was a losing battle. I took to buying myself the gift of a season subscription to the Arena Stage every year and planning a dinner out together at Nova Europa in Silver Spring. Last year, the subscription was to Arvada Center, and dinner was at Armando's. Bill even made note of that dinner on his Facebook page. This year, Josh and I shared Armando's takeout and a bottle of Chianti at home in front of the TV. He and Emily gave me the gift of music: Florence and the Machine and Adele, as well as a memory card for my Blackberry so I can use it as an mp3 player. I also got beautiful irises from one girlfriend and a wonderful book of daily meditations from another. There was a phone message that another gift from another girlfriend is on its way. I am well-gifted this year, showered with gifts, including the gift I bought myself -- a new stereo receiver for the Big Bad Blue Bronco that can play the music from my phone using Bluetooth. Josh and I are getting the Big Bad Blue Bronco ready to go on the road later this month, with the camper behind it, as I embark on a tender journey (along with Jack and Gidget) from Parker to San Antonio, Texas and back. At times, we will be following the same route that Bill and I took last year in May and June as we took our final road trip together. (And at times, we won't be following that route. I never want to drive through much less camp at Dalhart TX again as long as I live!) We'll visit friends in San Angelo, San Antonio, Rusk, and Midlothian; but mostly we're going down to San Antonio to take my oldest daughter Berinda for a week of camping on the Texas Gulf Coast. It will be a great adventure, and a great way to begin my 62nd year on the planet! Happy birthday to me! Somewhat Daily Dose of Wow! 11 Apr 11 Who Are We Lying To? I remember my father telling me, more than once because I was such an obstinate child, that when you tell a lie you must tell three more to cover that one up, and they just keep growing "until pretty soon, you're caught." It occurred to me this morning that we've already lied to ourselves several times before we've uttered the first lie out loud. Sure wish I knew why we do that. 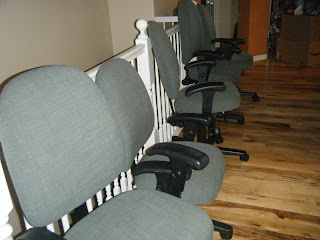 My house is full of chairs. It's been this way for almost a week now. It took two trips with a 26' rental truck, two grown men, and an old lady (that would be me) to transfer over 250 task and conference chairs from a warehouse in Golden to the garage, two bedrooms, the dining room, two hallways, the living room, and part of the basement. This began with my son, Josh, looking at ads for short sales and talking about flipping a house. 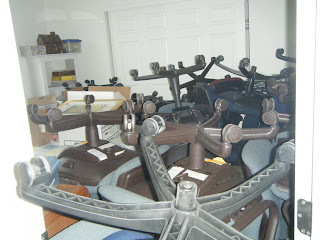 The next thing I know, we're flipping office chairs from the National Renewable Energy Laboratory (NREL). 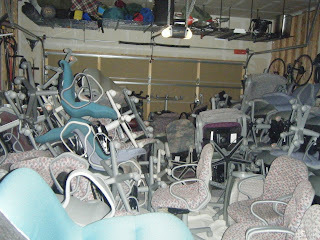 And in case you think I am exaggerating, here is what the garage looks like this morning. 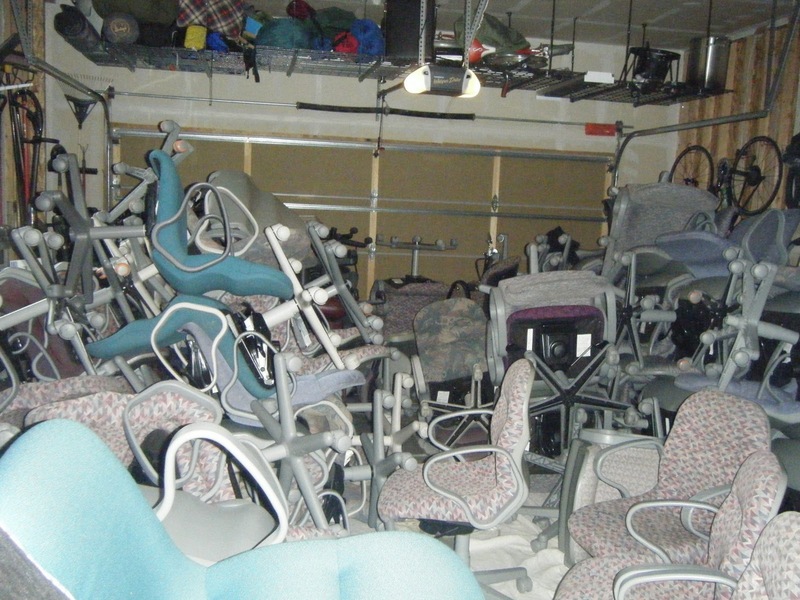 We started out with neat stacks in the garage, but as we cleaned and weeded out the broken and the nasty it came to more resemble the chaos that it really is. Josh bought one of those little upholstery cleaning machines meant for detailing your car, and has been giving it a workout every evening after he gets home from his primary job. My task is wiping down the "arms and legs and backs" to remove any grime left by the previous owners (I'm using Melaleuca's MelaMagic). After a dozen or so chairs, you try not to think too hard about what those hard little specks are that are stuck like bits of glue to the underside of the seat or the insides of the arms. 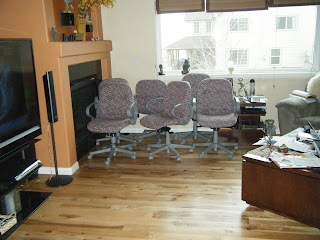 I have also been tasked with putting the ads up on Craig's List and following up on contacts. 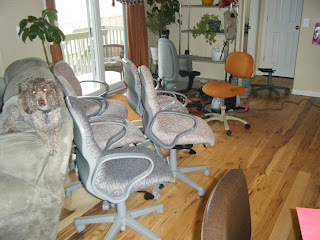 So far, we've sold seven chairs, and reserved three for our own use. Some of the chairs are fairly expensive to purchase and in practically new condition; but when the government builds a new building, they buy new furniture for it. 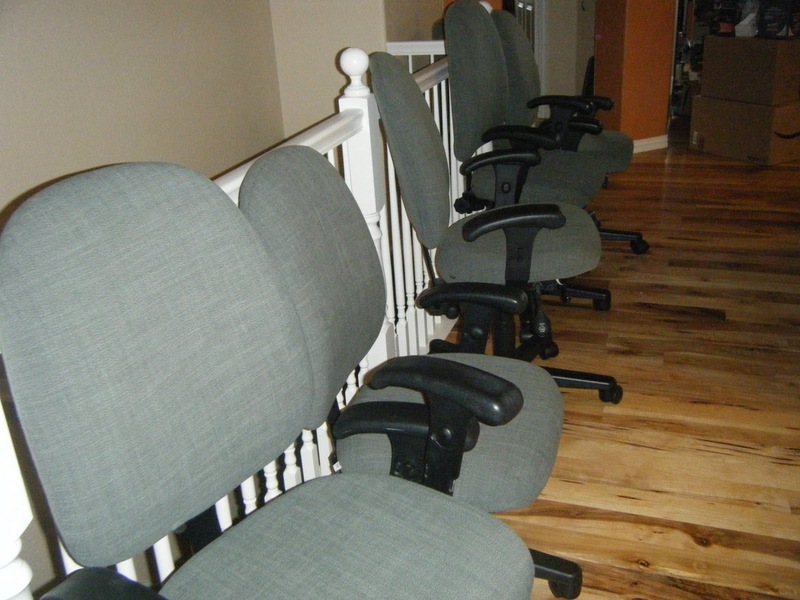 I managed to snag a really nice leather one for my office (retails at $999), and Josh found one (retails at $699) to replace the chair he was using at work as well as a great little armless task chair for working in the garage. We haven't yet broken even on the deal -- it will take another 14 or so chairs to do that -- but we have plenty of seating for company in the meantime!